The theme of most renovation projects is usually “out with the old, and in with the new”; however that’s definitely not the case in Yellowstone National Park. In fact, retro is the the key word for the recent upgrades at Canyon Lodge. Located about two miles from Yellowstone’s Grand Canyon, the original Canyon Lodge was constructed in 1955 as the cornerstone project in the National Park Service’s Mission 66 campaign. This program, which operated from 1956 to 1966, gave a much needed facelift to national park facilities that had been severely neglected during WWII and the Cold War. 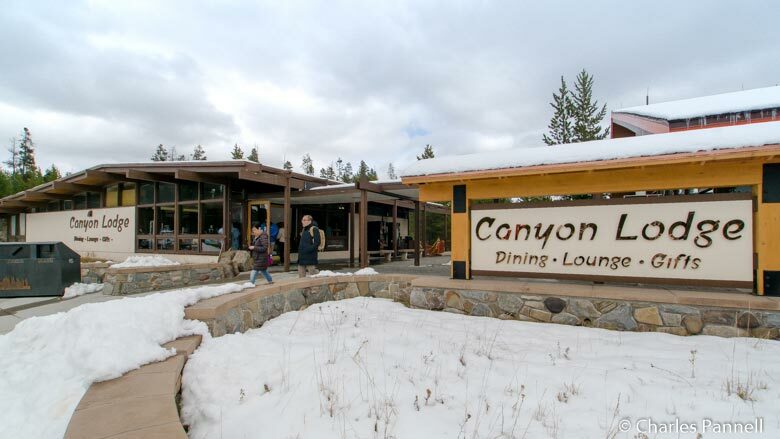 To that end, Canyon Lodge was relocated from the canyon rim, and redesigned to provide quick and efficient food service to the growing number of visitors who were flocking to this popular national park. Sadly though, time took its toll on this aging retro building, until it became a mere shadow of its former self. Fortunately Xanterra — the park concessionaire — came to the rescue in 2015, when plans were made to renovate this Mission 66 gem. And not only did they bring the structure back to its former glory, but they also added modern food options with a decidedly retro theme. 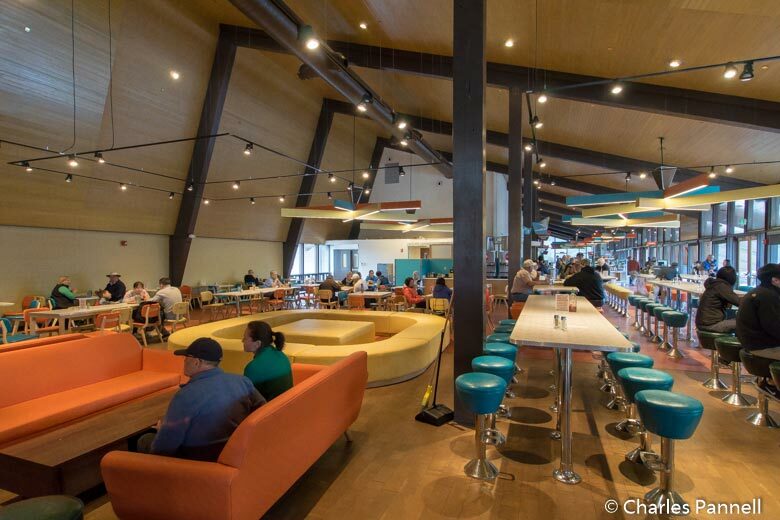 The results were unveiled in 2017, when the new cafeteria-style Canyon Lodge Eatery was christened. This new incarnation is pleasantly free of the partitions that divided the old food court; and there’s plenty of room to maneuver even a large wheelchair or scooter around the vibrant turquoise, yellow and orange chairs that line the Formica tables. There’s also a comfortable seating area around the centerpiece copper-topped open-hearth stone fireplace, and even a classic 1950s-style conversation pit. Top it all off with the brightly painted chandeliers and you have retro with a capital “R”. Food choices include a Fresh Wok area where you can build your own Asian bowl, and Slow Food Fast which offers meat and veggies paired with a selection of greens, potatoes and pasta. Grab and go sandwiches, soups, soft drinks and sweet treats are also available. And if you’d prefer to eat al fresco, there’s a group of picnic tables on a level concrete pad out front. But the Canyon Lodge Eatery is just the tip of the food iceberg at Canyon Lodge; as the adjacent Falls Café offers a nice selection of sandwiches, salads and snacks along with specialty coffee drinks and sustainably produced beer and wine. The M66 Bar & Grill — which is located at the far end of the building — serves up some tasty homemade soups, entree salads, yummy trout dishes, vegetarian delights and creatively prepared beef, pork and poultry. And if you’d like a sweet treat, the Ice Creamery features hand-dipped fresh Montana-made ice cream. Truly there’s something to suit just about every taste in the beautifully remodeled — and ultra accessible — Canyon Lodge. Check it out on your next visit to America’s first national park.